Argos fans will never forget the first game they played at BMO Field, but on Thursday night in Toronto it was for all the wrong reasons. Simoni Lawrence recovered a fumble and scored on a pick-six while former Argonaut Chad Owens put the game away in the fourth, giving the Ticats a 42-20 victory in front of 24, 812 during the first regular season game at BMO Field. Jeremiah Masoli was lights out for the Ticats, completing 27 of 37 passes for 318 yards and three touchdowns including 15 straight completions. On the other side of the stick, Argos pivot Ricky Ray was given no time to get comfortable as the Ticats’ front seven seemed to win all of the battles. Ray finished with 282 passing yards and a pair of touchdowns thrown to Vidal Hazelton on 26-of-36 passing but was sacked five times, fumbled once and also threw an interception. Lawrence was the biggest source of the Argos’ offensive frustrations, accumulating two sacks, a fumble recovery, an interception and a touchdown to go with six tackles. In the end it was the Ticats getting the picture perfect start to their CFL season, kicking things off with a 1-0 start to their 2016 campaign despite not having quarterback Zach Collaros and franchise defensive tackle Ted Laurent on the field. On a day the Argos and their fans waited a very along time for, past Argo greats Rocket Ismail, Joe Theismann, Damon Allen and Pinball Clemons were introduced before the game and Jacob Hoggard of Hedley sang the national anthem. But the pre-game sizzle fizzled fast for the home team. The Ticats took the early edge in field position and took a 2-0 lead on a conceded safety, the very first points of the 2016 CFL season. The field position trade-off was quickly rendered pointless for the Argos, a 15-yard unnecessary roughness penalty giving the Ticats the ball in Argo territory within striking distance once again. On the ensuing second-and-10, Masoli took a shot at the end zone for the wily veteran Andy Fantuz, who hauled in the deflection by Argos defensive back Isiah Green to score the first ever touchdown at BMO Field. The 39-yard score put the Ticats out in front 9-0, giving them full momentum and hushing the Argos faithful. Argos fans soon found out the visitors were not going to be polite house guests. The defence kept Ray scrambling through the first half, then after a sack on second down Lirim Hajrullahu’s punt was blocked and recovered deep in Argo territory. Maher added two more field goals before halftime for the Ticats to go up 18-0, while the Boatmen took back some of the momentum with a pair of Hajrullahu field goals, including one from 52 yards on the final play of the first half. With a chance to erase what looked like a disastrous first half, Ray completed back to back passes to Hazelton and Miles to move the Argos into Ticat territory. But it was all wiped away soon after, when Ray was hit from behind and lost control of the ball. Lawrence recovered the fumble to end the drive. The Argos made a quick stop and got in position for a 52-yard field goal by Hajrullahu, cutting the deficit to 18-6 at halftime, but in the second half any momentum was quickly extinguished. Lawrence continued what had quickly become a career night, intercepting a deflected pass and returning it 36 yards for six points the other way, putting the Ticats ahead 25-6. Close to reaching the point of no return, the Argos had an answer. Getting more and more comfortable as the night progressed, the 36-year-old Ray completed five straight passes, including two to Kenny Shaw and two to Tori Gurley. Scott Milanovich challenged for pass-interference on an incomplete pass to extend the drive, and on the very next play Ray found Hazelton for the one-yard touchdown to get the fans out of their seats. Before they could even sit down, the Argo offence was trotting back on the field. Banks fumbled the ensuing return and Ray went right back on the field to connect with Hazelton again from 10 yards out. Suddenly BMO Field was alive and so were the Argos, now trailing the Ticats 25-20 in the third quarter. Facing some urgency for the first time all night, though, Kent Austin’s club mounted a much-needed response. It started with a 32-yard pickup by a wide open Luke Tasker and finished as quickly as it started, with Banks creating space against Akwasi Owusu-Ansah in the back of the end zone and restoring the Ticats’ two-score lead. The Argos showed some life with a 38-yard completion to Shaw but were stopped again by the Ticats’ dominant pass rush on a sack against Ray. Pinned deep in their own end, the Ticats needed to move the football and milk the clock. They did that, starting with a 19-yard pass to Owens then slowly but steadily moving up the field. Masoli completed nine straight passes, book-ending the drive with a touchdown pass to Owens to put the game on ice and give the Ticats a 39-20 lead with just over seven minutes left. Shaw led the game with seven catches for 109 yards while Brandon Whitaker found little room to run, finishing his night with two yards on three carries to go with three catches. Fantuz had a big night for the Ticats after signing a contract extension in the off-season, tallying up 99 yards and a touchdown in the win, including the first at BMO Field. C.J. Gable carried the ball nine times for 29 yards and did not catch a pass. Maher connected on all four of his field goal tries while Hajrullahu was a perfect two-for-two. Argos left tackle Josh Bourke left the game late in the first half, while safety Jermaine Gabriel needed to be stretchered off with five minutes left in the game. 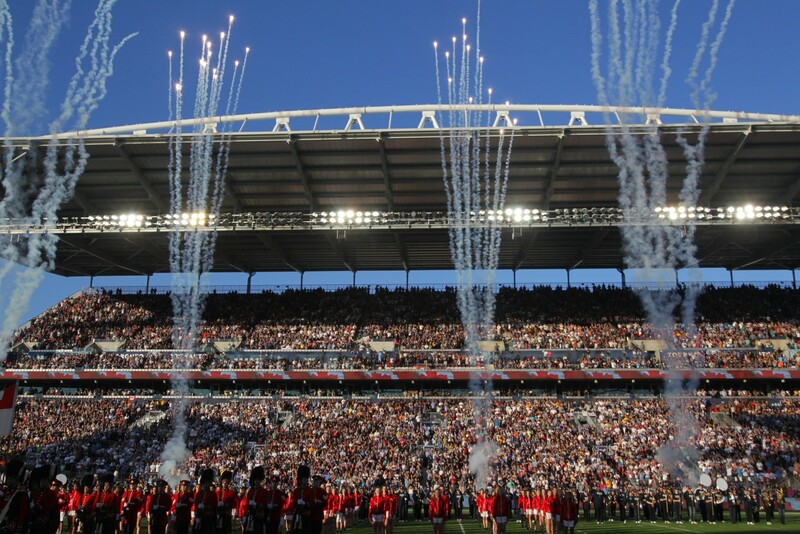 The Ticats will carry their momentum into their home-opener against the BC Lions in a Canada Day showdown July 1. The Argos, meanwhile, are on the road for their next two, starting with a matchup in Regina against Chris Jones and the Riders on June 30.